We cover 'satellites', 'ground station network', 'data processing' and 'data delivery' through international collaborations. Forest fire is said to produce more than 30% of Carbon dioxide due to human activities. 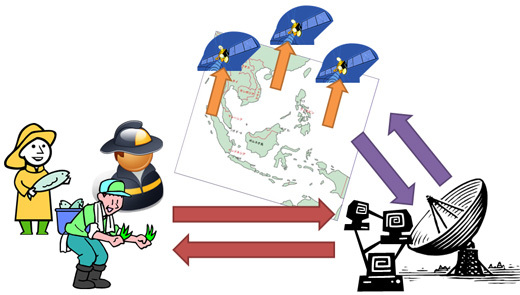 For effective fire-fighting, frequent observation is necessary and our satellites will provide the monitoring system. Primary payload is a TIR sensor that is more suitable cost-wise and size-wise for microsatellite. TIR sensor has its range in either 4μm or 10-12μm. TIR sensor has approx. GSD 200m and approx. swath 100km. Secondary payload is a visible wavelength sensor to assist wildfire identification. Sets few target areas for nominal observation. Tries to achieve frequent observation of the target areas by sensor pointing. Wildfire identification is conducted on the ground. copyright © UNIFORM Project. All Rights Reserved.